Go to original pattern for design DROPS 21-15. 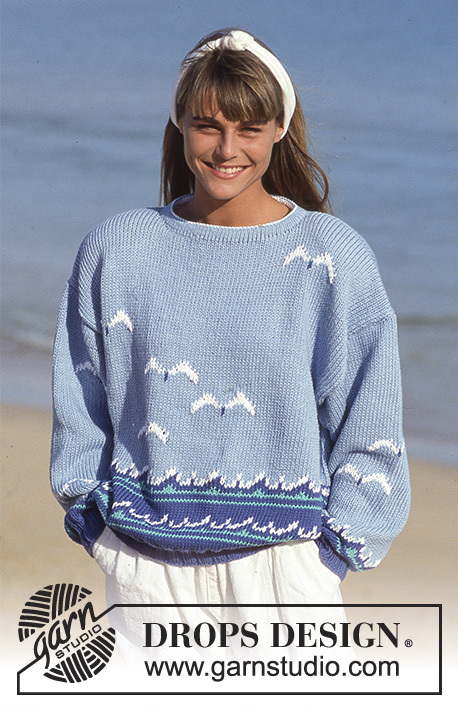 DROPS jumper with seagull pattern in “Paris”. 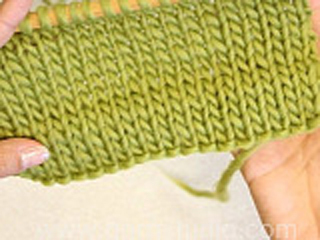 DROPS circular and double pointed needles size 3 and 5 mm/US 2.5 and 8 - or size needed to obtain 17 sts x 23 rows in stocking st on needle size 5 mm/US 8 = 10 x 10 cm. 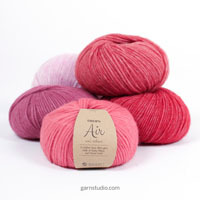 You can get the yarn to make this pattern from	32.40$. Read more. Pattern: See diagram M.1 to M.3. The diagram shows the pattern from the RS. Rib: *K2, P2 *, repeat from *-*. 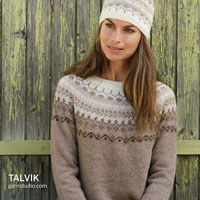 Body: The sweater is knitted in the round on circular needle. Cast on 152-156-164 sts on circular needle size 3 mm / US 2.5 with blue and work 5 cm / 2'' Rib. Change to circular needle size 5 mm / US 8 and continue in M.1, at the same time inc 36-40-48 sts evenly on first round = 192-204-216 sts. REMEMBER THE GAUGE! After M.1 complete piece in light blue. When piece measures 24-24-24 cm divide the piece in two and complete front and back pieces separately. Back piece: = 96-102-108 sts. 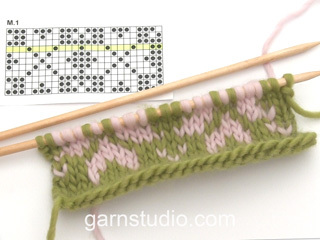 When piece measures 58-59-60-61 cm bind off the middle 38-40-40 sts for neck and complete each side separately. Dec 1 st on neckline on next row. Bind off when piece measures 59-60-61cm. Front piece: = 96-102-108 sts. When piece measures 24 cm work M.2 25-28-31 sts in from the right. When piece measures 28 cm work M.2 47-50-53 sts in from the right. When piece measures 32 cm work M.2 31-34-37 sts in from the right. When piece measures 40 cm work M.2 8-11-14 sts in from the right. When piece measures 50 cm work M.2 64-67-70 sts in from the right. Now complete piece in light blue. When piece measures 54-55-56 cm bind off the middle 30-32-32 sts for neck and complete each side separately. Bind off to shape the neckline on every other row: 2 sts 1 time, 1 st 3 times. Bind off remaining sts on shoulder when piece measures59- 60-61 cm. Right sleeve: Cast on 36-36-40 sts on double pointed needles size 3 mm / US 2.5 with blue and work 5 cm / 2'' Rib. 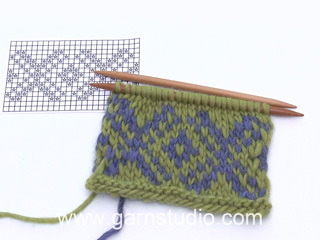 Change to double pointed needles size 5 mm / US 8 and continue in M.3 (place a pattern repeat mid upper sleeve), at the same inc 13-15-11 sts evenly on first round = 49-51-51 sts. After M.3 continue in light blue. At the same time after the Rib inc 2 sts mid under arm a total of 25-25-25 times on every 3rd and 4th round alternately = 99-101-101 sts. When piece measures 30 cm / 11 3/4'' work M.2 on the middle 17 sts. When piece measures 47-46-45 cm bind off 6 sts mid under arm and complete piece back and forth on needle. 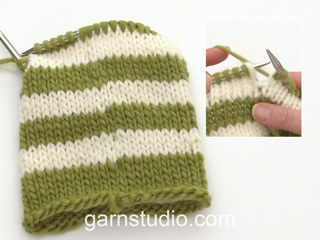 Bind off to shape the sleeve cap on every other row: 10 sts 2 times. Bind off remaining sts, piece measures approx 50-49-48 cm. 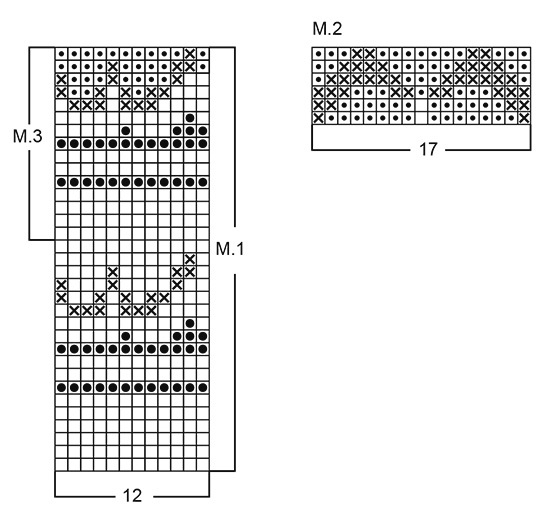 Left sleeve: Like right sleeve, but work M.2 on the middle 17 sts when piece measures 16 cm. When piece measures 38 cm work the middle 48 sts as follows: M.2, 31 light blue sts. Assembly: Sew shoulder seams. Pick up approx 90 sts round neck on needle size 3 mm / US 2.5 with light blue and work 2 cm / 3/4'' stockinette st, change to white, P 1 round (= folding edge), 2 cm / 3/4'' stockinette st, bind off. Fold edge double towards WS and fasten. 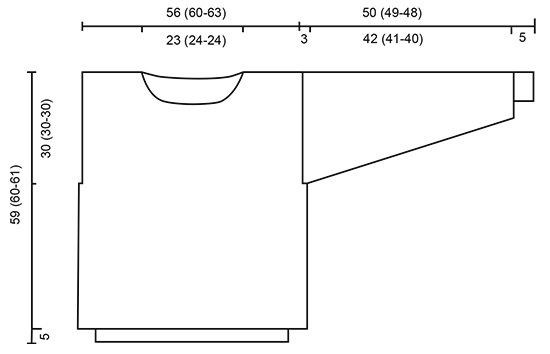 Sew side seam up to armhole, armhole = 30-30-30 cm.